To Cite: Jabalameli M, Bagherifard A, Hadi H, Qomashi I. 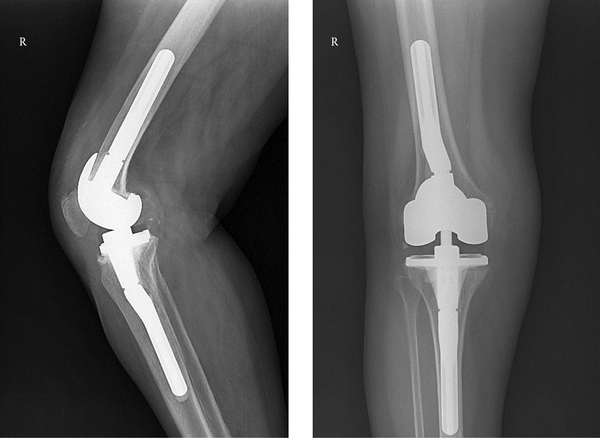 Infected Total Knee Arthroplasty by Brucella melitensis: A Rare Case Report, Shafa Ortho J. 2016 ; 3(3):e6265. doi: 10.17795/soj-6265. Introduction: Brucellosis is a zoonotic infectious disease with worldwide distribution, especially in the south and central American countries, the Middle-East and the Mediterranean areas. Knee prosthesis infection due to Brucella spp. is very rare with the first case reported in 1991 and the ninth case reported in 2010. 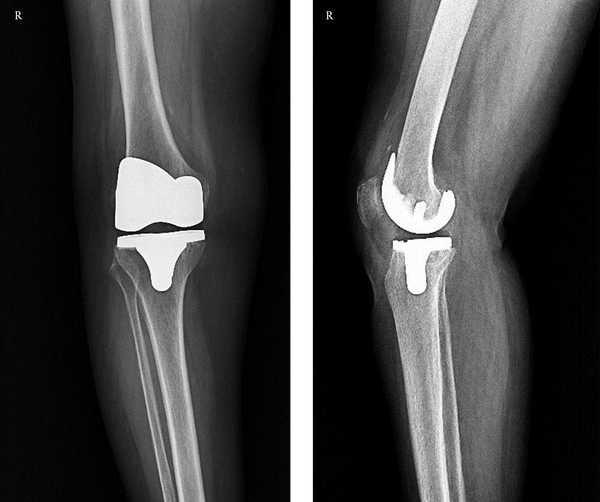 Case Presentation: Here is reported a case of a 68-year-old female patient, referring to Shafa Orthopedic hospital, Tehran, Iran, complaining about a discharge from right total knee arthroplasty. All of the knee joint aspirations and laboratory tests were negative for infection. Initially, no clear reason was found for this painful operated knee and it was decided to revise it; however, intra-operative samples were positive for Brucella melitensis. Unfortunately, serum indicators of Brucellosis (Wright, Coombs Wright and 2-mercaptoethanol (2ME) tests) had not been checked in the preoperative evaluations. After six months of antibiotic therapy for brucellosis, a second stage revision surgery was performed successfully. Conclusions: Prosthetic infection by Brucella species is very uncommon, this is the tenth case of total knee prosthesis infection with Brucella spp. reported in the literature but all orthopedic surgeons, especially those who work in the endemic areas, should evaluate a suspected joint for brucellosis. Brucellosis is a zoonotic infectious disease with worldwide distribution, especially in the South and central American countries, the Middle-East and the Mediterranean areas (1). Brucella spp. are Gram-negative coccobacilli which transmit to human through the consumption of unpasteurized infected animal milk products, direct contact with infected parts of animals and infected aerosolized particles inhalation (1-4). In brucellosis any organ or system of the body can be involved. Initial presentations of Brucellosis are recurrent fever, sweating, headache, apathy and asthenia. Osteoarticular complications of brucellosis had been reported in 10% - 60% of the cases (5). These complications are arthritis, bursitis, tenosynovitis, sacroiliitis, spondylodiskitis and osteomyelitis (6-16). Brucella spp. are intracellular microorganisms; therefore, it is necessary to use an antibiotic that is able to penetrate the cell membrane. Rifampin, tetracycline, co-trimoxazole and aminoglycosides are the best choices (2, 3). Knee prosthesis infection due to Brucella spp. is very rare with the first case reported in 1991 (2) and the ninth case reported in 2010 (5). Prosthetic infection may be local (the surgical site) or systemic (hematogenous). Here is presented the tenth case of total knee prosthesis infection with the Brucella spp. Written consent was taken from the patient and the ethics board approved the report. A 68-year-old female referred to Shafa Orthopedic hospital, Tehran, Iran, complaining about a discharge from a wound on her right knee, caused by an arthroplasty surgery. She had been hospitalized in another center for a total knee arthroplasty (TKA) in September 2013. Unfortunately, she never achieved an acceptable range of motion (ROM) in the knee that received the surgery. Her chief complaint during the first seven months was pain and the limited ROM mentioned above. After eight months, she started having a discharge from the surgical wound. An aspiration was performed on her knee and despite having a negative bacterial culture test, she was treated with antibiotics. However, the discharge did not stop. Finally, after one year, she came to Shafa hospital with stiffness, pain and discharge from the joint. As the first step, the knee was aspirated to rule out the infection and examine the fluid for cell count, Gram stain and culture it for 48 hours. All of these examinations were negative. Simultaneously, the complete blood count (CBC), erythrocyte sedimentation rate (ESR) and C-reactive protein (CRP) were checked, all of which were in normal range. Then, any possible abnormalities in the position and the rotation of the femoral and tibial components were checked with X-ray and computed tomography (CT) scan and there was no abnormal finding (Figure 1). Finally, no clear reason was found for this painful operated knee and it was decided to revise it. 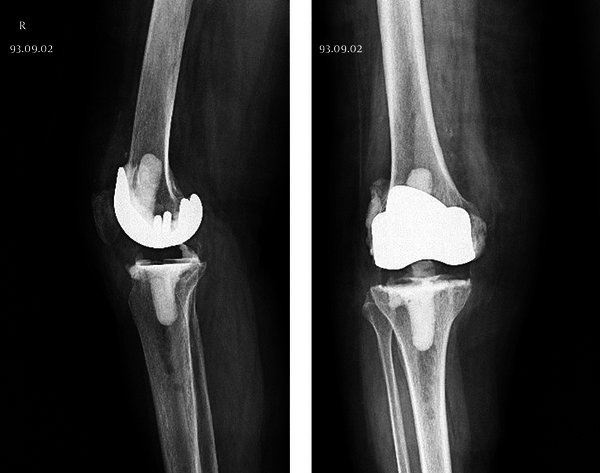 The patient underwent a revision arthroplasty surgery at the center in November 2014. The incision was done on her previous surgical scar. After taking out the sinus tract, a medial arthrotomy was conducted and some of her synovial fluid was collected in special culture plates. The plates were immediately sent for culturing and antibiogram testing. 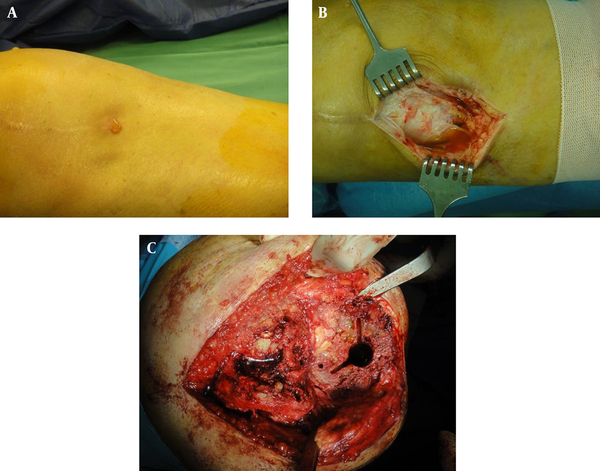 The femoral and tibial components were separated in order and some tissue surrounding the tibial and femoral component was extracted and cultures were prepared in the operating room immediately in plates (Figure 2). The synovial tissue, as well as other tissues surrounding the joint, was fully debrided. After the sterilization of the femoral component, it was placed with the cement in the femoral side and a new polyethylene spacer was placed in the tibial side with the cement (Figure 3). The wound was closed using routine techniques. The sample was incubated for more than the usual time to rule out unusual infections. However, the tests returned positive for Brucella sp. Unfortunately, serum indicators of Brucellosis had not been checked (Wright, Coombs Wright and 2-mercaptoethanol (2ME) tests) in the preoperative evaluations. The patient was subsequently put under treatment for Brucellosis. After six months of treatment and subsequent to making sure that all the relevant laboratory results were negative for Brucella spp., a second stage revision surgery was performed in June 2015. A permanent component was placed for the patient (Figure 4). During the surgery, some of her synovial fluid, synovial tissue and the tissue surrounding the temporary components were extracted and sent for culture. All the aforementioned tests returned negative. A, Discharge from the joint; B, fluide collection; C, proximal tibia after component removal. The principal point of this case presentation was that brucellosis should be considered in all painful prosthetic knee joints and it should be in the routine evaluations for ruling out the infection. In a study by Weil et al., (3) seven cases of periprosthetic joint infection with Brucella spp. were reviewed, four of which were in knee joints. Cultures from aspirated joint were positive in four cases, periprosthetic tissues were positive in two cases and blood sample was positive in one case. All patients who had been checked were strongly positive for Brucella specific serum tests. Nevertheless, this infection is very unusual in periprosthetic joint infection of the knee and only nine cases were reported in the literature (2, 3, 5, 17-19). In this case, if the authors had been aware of this infection, the serum indicators of brucellosis could have tested and the cultures incubated in a longer time period to detect the Brucella spp. and the treatment could have been started before the first stage of revision surgery. Prosthetic infection by Brucella spp. is very uncommon but all orthopedic surgeons, especially those who work in the endemic areas, should evaluate a suspected joint for brucellosis. The best and fastest way to diagnose is serologic evaluation (3, 20). After the diagnosis, an aggressive treatment with appropriate antibiotics, at least for three months to reach the normal serologic limits, is necessary before doing the final procedure. We recommend the routine test of wright, coomb’s wright and 2ME in all prosthetic joints suspected to infection. Authors’ Contribution: Study design and supervision, Mahmoud Jabalameli; writing and revision of the manuscript, Mahmoud Jabalameli, Abolfazl Bagherifard, Hosseinali Hadi, Iman Qomashi.